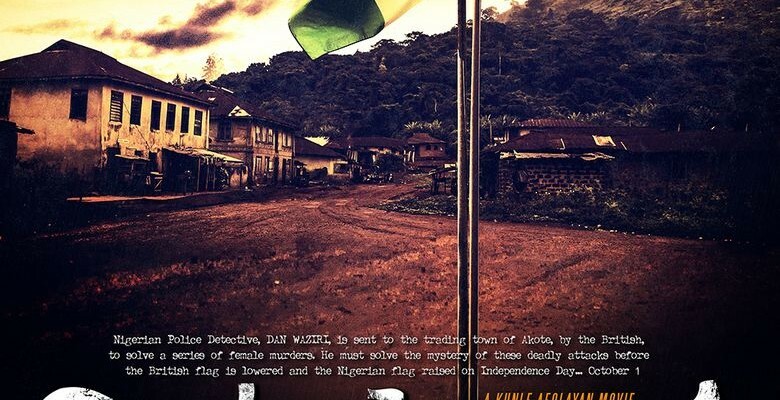 In this grim period thriller, a police detective hunts for answers about a serial killer targeting Nigerian women. Set in the 1960s against the backdrop of a country pursuing its independence from British rule, tensions run high as Danladi’s investigation brings him into contact with tribalism and other dark and dangerous sides of society. Izuzu, Chidumga. “Kunle Afolayan's ‘October 1’ Is a Master Stroke for Nollywood.” Pulse, 30 Sept. 2017, www.pulse.ng/entertainment/movies/kunle-afolayans-october-1-is-a-master-stroke-for-nollywood-id7399670.html. Nwelue, Onyeka. “Movie Review: October 1st - A Kunle Afolayan Film, By Onyeka Nwelue.” The Trent, 6 Oct. 2014, www.thetrentonline.com/movie-review-october-1st-kunle-afolayan-film-onyeka-nwelue/. Onikoyi, Babatunde. “October 1 Dir. by Kunle Afolayan.” African Studies Review, vol. 59, Apr. 2016, pp. 234–235, muse.jhu.edu/article/614582/pdf.